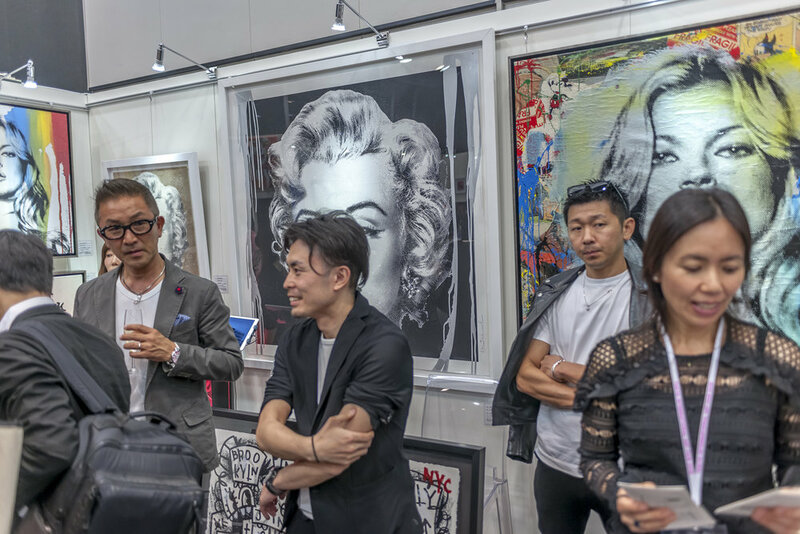 More than 7000 art aficionados were eager to enter through the doors of BelleSalle Roppongi over the weekend (Friday 25th and Saturday 26th May 2018) as Tokyo city hosted the fourth Tokyo International Art Fair organised by the Global Art Agency (GAA Ltd). Roppongi BelleSalle was arranged to perfection with over 100 artist and gallery stands from over 30 countries from around the world. The atmosphere was charged with positive vibes as visitors took in the wide range of original art available and took pieces they had purchased home. Charles Ho from The Wall Street Journal said: "What an evening in Roppongi, where international artists meeting global insights, a superb platform for uprising talent." New York Gallery from Japan sold within the first hour an original painting by the artist FLORE for 1.2 mill JPY, followed by many more during the art fair. First prize winner of 2016 Best TIAF Artist Award August Vilella who sold 3 artworks last year worth $ 45,000 USD was back again this year making another outstanding performance... "It is like being family over-here, always a pleasure to exhibit with such a fine organisation." From left to right: Manu Alguero, Natal Vallve, Igor Abramovich (New Now Gallery) Barat Thakur, Cristina Jin, New Now Gallery, Joëlle Dinnage. First prize went to Bharat Thakur who displayed a miracle of realism portraits (for some on the border shuddersome) although technique and style of the highest form! The second prize went to New Now Gallery, owned by Igor Abramovich who's vision lays with Ukrainian art and helping create painting collections in Ukraine. Promotes cooperation between Ukrainian painters and renown auction houses of the world — Sotheby’s, Christie’s, Phillips and Bonhams. Believes that nowadays national art is becoming a worthy partner of international cultural dialogue. Third prize went to Cristina Jin ( New York) originally comes from New Zealand and she believes our purest form of emotion are in the moments. Those emotion is the most honest, natural and emphatic. She wants to keep that entrance of memory, no matter she goes back or not. Christina always carries her easel wherever she goes. Painting for her is to capture the natural first-hand reaction to her encounters, the thrill and the fear and the realization of her adventure. "TIAF 2018 was a great success not only for the big selection of exhibitors from all around the world. It was a window of what's going on in the contemporary art world nowadays" Natal Vallvé said. "We'll be back for more in 2019 and are already planning next year's event," Joëlle Dinnage said.